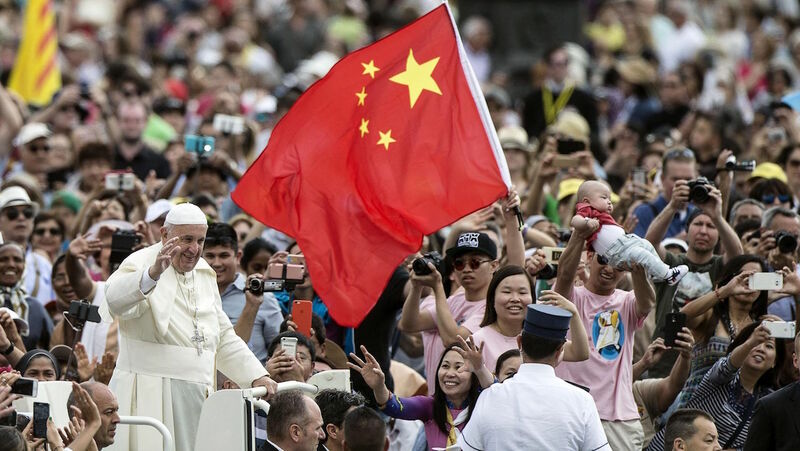 This month the Vatican and China have entered into some sort of agreement that is meant to allow China's Catholics to recognize the pope as the head of the Church while granting the Communist government of China a say in nominating bishops. This is supposed to normalize relations between Church and State there. I say "some sort of agreement" because the details of this concordat are being kept confidential. For example, while the agreement calls for the legitimization of the current bishops of the Chinese Catholic Patriotic Association, it's uncertain exactly how future bishops are going to be selected—although it seems likely that the Communist government will select bishops, but the Vatican will have some sort of "veto" power, but it's unclear how often the Vatican can exercise it. There are many facets of this bizarre agreement we could question. For example, in an age when the Vatican is so woke that it vigorously denounces plastic litter in our oceans and issues documents on the "Ten Commandments for Drivers", why the silence on China's egregious litany of human rights abuses? Why is the Vatican ignoring the aspirations of Chinese Catholics, both lay and clergy, who have suffered for their fidelity to the true, underground Church? What are we supposed to think when the details of the agreement are secret? If this agreement is so great, why are the details secret? Why does the Vatican have any confidence that the Communist Party of China is acting in good faith, especially since even as the agreement was being drafted, Christian churches were being vandalized and demolished throughout China by government agents? Why no adamant, principled stand for religious liberty in a place where Catholic priests of the underground Church regularly die in custody or under mysterious circumstances? Or is religious liberty and dialogue only something we trot out when Catholics want to do things like spend money to build Mosques for Muslims? Pope Francis has given up the very real authority to name bishops in exchange for a largely symbolic recognition as head of China's Catholics. The pope has effectively washed its hands of the underground Catholic Church in China in exchange for some momentary media coverage and a mention in the history books. The true faith in China is going to be hopelessly muddled now. The distinction between the true Church and the state Church will be obliterated. Who is validly consecrated will become a moot point; way back in 2007, Pope Benedict lamented that the status of those government bishops who had been legitimized remained murky even after legitimization due to misinformation. "In most cases," Benedict said, "priests and the faithful have not been adequately informed that their Bishop has been legitimized, and this has given rise to a number of grave problems of conscience. What is more, some legitimized Bishops have failed to provide any clear signs to prove that they have been legitimized" (Benedict XVI, Letter to Chinese Catholics, 2007). This problem will only grow worse with more legitimization coming. The Catholics who have remained faithful to the underground Church will increasingly wonder why they are suffering so much on behalf of an institution that seems embarrassed by their existence. Francis has exchanged China's birthright for a bowl of pottage. So, in the midst of all the garbage coming out, I thought I'd share some good news. In May I posted an appeal to help a friend of mine, Bill Price, who had fallen off a scaffold and suffered severe injuries to his leg. Bill is the choir director at Our Lady Star of the Sea in Jackson, Michigan for the traditional Latin Mass. At the time of his injury, his wedding was only a few weeks away. I just wanted to post an update that the appeal was able to raise over $20,000 for Bill's medical expenses (Deo gratias). Bill is recovering fine and was able to finally get married, albeit after postponing the wedding for a few months. I recently attended the wedding of Bill and Sipjke at Our Lady Star of the Sea. It was a beautiful wedding in the traditional Roman rite, only the second traditional rite wedding I have been to in a decade. Bill was not totally back to his old self yet; he had to go up the aisle and approach the altar on crutches. I was very moved by the sight. Here's a picture of the bride and groom, crutches and all. On behalf of myself and the Price's, thank you for your kindness. And if you want to hear Bill's schola, I actually have a recording of them on the USC Youtube Channel. In the midst of this crisis, I am seeing many well-intentioned Catholics reaching a point of total loss of faith in the hierarchy and calling essentially for lay oversight of the Catholic episcopacy. This is just another dead end. Besides being antithetical to the entire hierarchical constitution of the Church, lay control in other areas of the Church has been a debacle. Has lay control of Catholic schools improved their quality? It's interesting that in the memoirs of Fr. Theodore Hesburgh, former President of Notre Dame, he essentially identifies the turning of the university over to lay control as the moment when it lost it's Catholic identity. Have our Catholic dioceses become any better managed over the past fifty years since being stocked with lay committees? Is religious education in our parishes more vibrant that priests and sisters have been replaced with lay volunteers? Lay people do have an active vocation within the Church. I do not believe that lay people simply need to shut up and pray. They can work for change in the Church by how they allocate their resources. They can form organizations whose purpose is to advocate for certain reforms. They can leverage their numbers to put moral pressure upon corrupt diocesan officials to act justly. Those lay persons who are employed in diocesan administration can commit themselves to total transparency if they see any civil crimes being committed and can refuse to participate in any cover up or obfuscation. Lay persons who have knowledge of criminal activity on the part of the clergy can take this information to civil law enforcement. Lay people who are in the media or gifted writers can use their positions to advocate for needed reforms within the Church. They can protest the transfer or rehabilitation of known abusers. All of these things are valid and praiseworthy exercises of the energy of the laity directed towards reform. But the laity themselves are not the answer. The laity cannot be exalted above the clergy. The laity cannot be put in positions of authority over the bishops, as if the bishops are answerable to some lay committee. The laity cannot become a functional part of the hierarchy. Besides being totally foreign to the Church as it was constituted by Christ, this risks turning the laity essentially against the clergy. If the laity are taught to believe that lay "policing" actions are all prevents the clergy from descending into criminality and abuse, it's hard to see how the laity will not end up holding the clergy in contempt. They will essentially become infected by the secular spirit that sees all celibate clergy as suspected criminals. It treads the same waters as the spirit of persecution where every clergyman is de facto an enemy of the state by virtue of being ordained. "Upon all the laity, therefore, rests the noble duty of working to extend the divine plan of salvation to all men of each epoch and in every land. Consequently, may every opportunity be given them so that, according to their abilities and the needs of the times, they may zealously participate in the saving work of the Church" (LG 34:4). It is clear that the laity have a role in building up the Church, "working to extend the divine plan" and that they are to have opportunities to do so "according to their abilities." But in what sphere does the Church envision these lay persons "extending the divine plan?" Does this really entail giving lay people supervisory control over clerical bodies? The Council does call for the laity to "zealously participate" in the life of the Church, but that participation is to be carried out "in the program of their secular life" by means of "continuing conversion," not by assuming literal control of institutions run by clergy. The laity are to sanctify their own lives and act for change specifically within the spheres of their secular activity—not by assuming the roles the clergy. That actually goes against what LG specifically calls for. It's very similar to the way people misunderstand the concept of "active participation" when it comes to the liturgy. "Let the spiritual shepherds recognize and promote the dignity as well as the responsibility of the laity in the Church. Let them willingly employ their prudent advice. Let them confidently assign duties to them in the service of the Church, allowing them freedom and room for action. Further, let them encourage lay people so that they may undertake tasks on their own initiative. Attentively in Christ, let them consider with fatherly love the projects, suggestions and desires proposed by the laity.However, let the shepherds respectfully acknowledge that just freedom which belongs to everyone in this earthly city"(LG, 37). Pastors are to respect the ambitions of the laity, support their plans, and "assign them duties," but nowhere does it suggest that the managerial roles of the laity and the clergy be switched, especially within the hierarchical administration of the Church itself. The calls for lay oversight of the clergy will simply exacerbate the problems within the Church. To posit the current situation as continued clerical corruption vs. lay control is nothing other than a Scylla and Charybdis dilemma. One of the central characteristics of liberalism is that the liberal cure for the problems of revolution is always more revolution. The revolution of the Lavender Mafia is producing a tidal wave of chaos; predictably, people are calling for greater revolution as the cure to the ills of the revolution. One more thing...it is indicative of the modern mentality that we always seek institutional, structural changes to address what are ultimately personal failings. To be sure we need our institutions to be strong and our structures just, but bureaucratic solutions will not ultimately fix what is, at is core, a moral rot.